Four handlebar bags that I own. All are pretty uncommon. 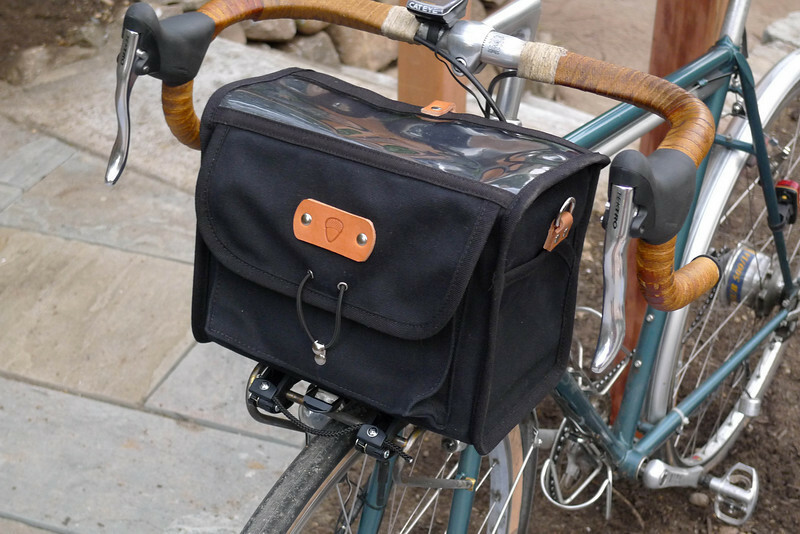 Acorn Boxy Bag -- This one is pretty similar to most classic French handlebar bags. It is made from cotton duck. Ravenna Bag -- Rory had 10 of these made by a Seattle-area seamstress last year. It is styled like a French handlebar bag, but significantly larger. I can fit my (small) laptop into it for commuting. This bag is made from nylon packcloth and is very light considering it's size. Freight Baggage Pass and Stow Bag -- This bag was made by Freight Baggage for Pass and Stow. It is built like a messenger bag, but is designed to fit onto mid-sized porteur racks. It has the highest volume and is the comfortable to carry on or off of the bike. It is secured to the rack with special snaps. Ortlieb Bike Basket -- Has it's own cool mounting system that is easy to adapt to most racks. The Ravenna Bag and Acorn Boxy Bag both fit onto the rack shown in the first few photos. Acorn bag mounted on my bike. The handlebars are 44cm wide Nitto Soma bars.